OpenED SA was developed through observations by the Convergent Media Collective. Jeremy Zunker and joey lopez were hanging out and talking about GIS systems and big data in general. We saw a trend in the maps we were generating through the New York Census Mapping Project, a publicly available mapping tool, that intrigue us to research further. 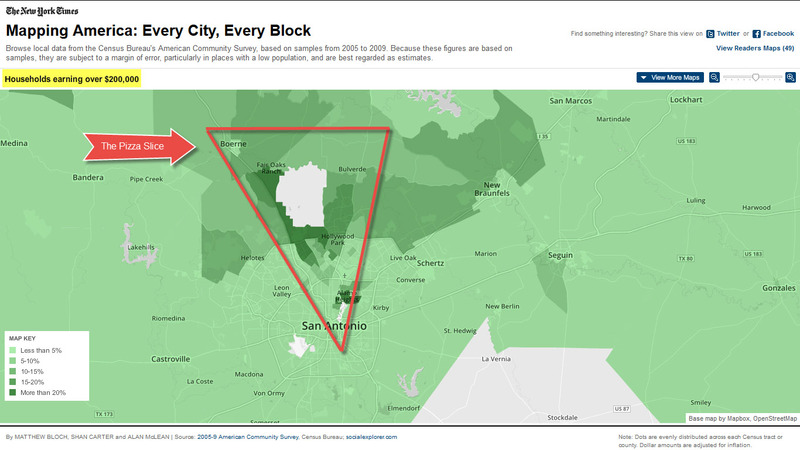 We noted is a high level of affluence on the north side of San Antonio that is disproportionate to the rest of the greater San Antonio. We kept running various searches and also noticed there was also some race based consistencies when looking at the map. We noticed a high level of Anglo American population in the affluent areas. 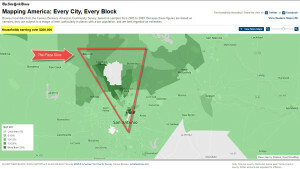 We also noted a high level of minorities in the least affluent areas of San Antonio. As San Antonians we were not necessarily surprised by these findings, but our suspicions were definitely affirmed that we indeed to have a great geographical divide between the haves and have not’s. Jeremy coined the term “pizza slice” for the area for which we identified as having a disproportionate level of affluence. Aaron Peña, a fellow collective member rendered a graphic that we feel gives a visual example of what our city might look like if we were a whole pizza. 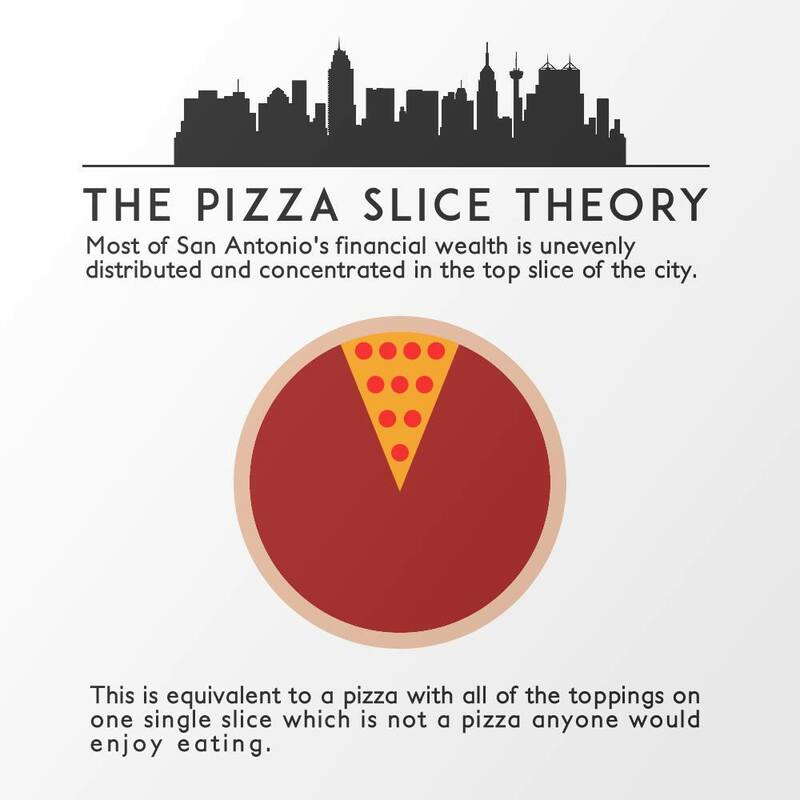 The “pizza slice” graphic has since been used online heavily when discussing inequity in the San Antonio area. 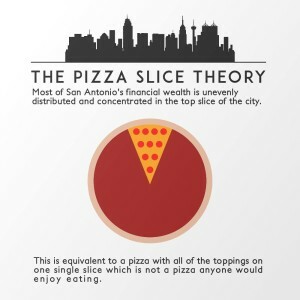 It should be noted that even within the slice itself there should actually be some pepperonis missing as there are a couple of spots where there is less affluence. Documentation: This blog itself has been setup to document and highlight various Art & Technology initiatives around the greater San Antonio area. We believe documentation of the small to medium individual/non-profit efforts being made to bring Art & Technology to the greater San Antonio area has value that works on multiple levels. Whether it is bringing public awareness or giving an individual or non-profit the ability to document their work in order to apply for grants; our goal is to document their work using video, photography and text. 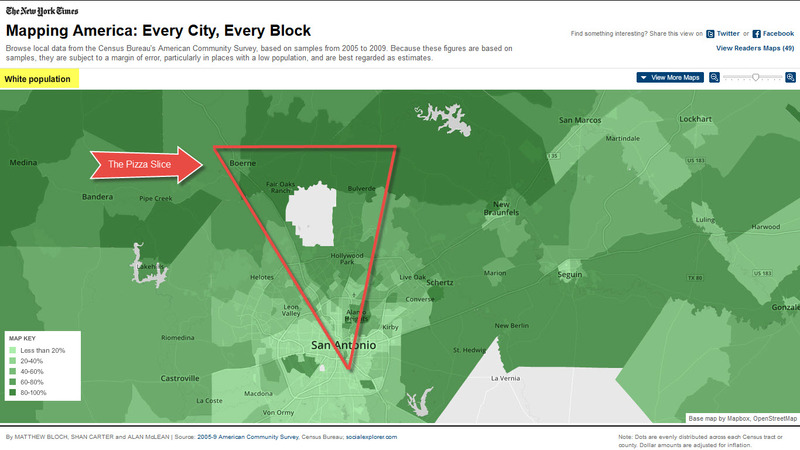 Mapping: Using the google maps API, we are working with developers to create a map that documents art & technology resources available around the greater San Antonio area, specifically starting from the urban core and working our way outward. You can see the work we have accomplished so far by visiting our map link. Community Outreach: We have a team of educators and civic “engagers” who are taking note of the various art & technology initiatives around San Antonio and developing curriculum and workshops that can easily be implemented in areas in need. All of our work will be opensource and documentation of our efforts will be provided through our blog. We welcome additional collaborators and assistance, if you are interested feel free to email us at contact@openedsa.org.